I have had duck confit in France, and it was really tasty. When I made it with the duck available here it was ok, but not as good. Cassoulet is a signature dish and is on many restaurant menus in the southwest of France, but I never have ordered it because there are so many other dishes to try. 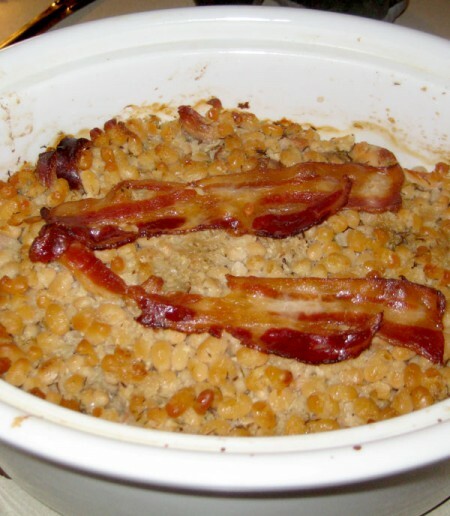 I have made Cassoulet before as well, and it was good but not really memorable. This time I followed the recipe from Anthony Bourdain that is in the Daring Cooks recipe. I made confit using chicken rather than duck, and used a combination of olive oil and butter rather than the difficult to find (in this area) duckfat. For beans I used navy beans. The chicken confit was cooked in a slow cooker, varying the temp setting between low and high, trying to keep it from boiling. The aroma of the confit was devine. For the Cassoulet I used a good pork sausage that had no gluten fillers in it. The confit was made one day, the beans the next, then the Cassoulet assembled the next, and baked again the following day for a comfort food dinner party. The final baking smelled devine, and the Cassoulet was delicoius. Everyone had seconds, always a good sign!. I really liked the fact that on the day of the dinner all I had to do was reheat the Cassoulet and make a salad to go with it. Greg and I ate the leftovers the next two days, and they just got better. In terms of next steps, the confit was interesting, but the Cassoulet would be great without it as well. I will definitely make this again when I want a conforting meal with friends. Here is a link to the daring bakers recipes. Thanks to Jenni and Lisa for getting me to make Cassoulet again with a better method. This entry was posted on Monday, January 17th, 2011 at 6:30 pm	and is filed under Daring-Cooks, gluten-free. You can follow any responses to this entry through the RSS 2.0 feed. Both comments and pings are currently closed.